When I (David) first walked into that factory as a laborer over 25 years ago, I had no idea what the future held for me. I journeyed from working on the floor, to General Manager, CEO, and ultimately founding my own management and leadership consulting company. Additional life roles included Strategic Change Agent, Speaker, Organizational Culture Creator, Coach, Facilitator, and Writer, amongst many others. My whole life has been about change – evolving and transforming as required to be not only successful professionally but also personally fulfilled. The one characteristic that has made each of my life roles reach new heights is resilience. The very characteristic that has made Ford one of my favorite corporations. When the 2008 global financial crisis hit, Ford leadership demonstrated resounding resilience. 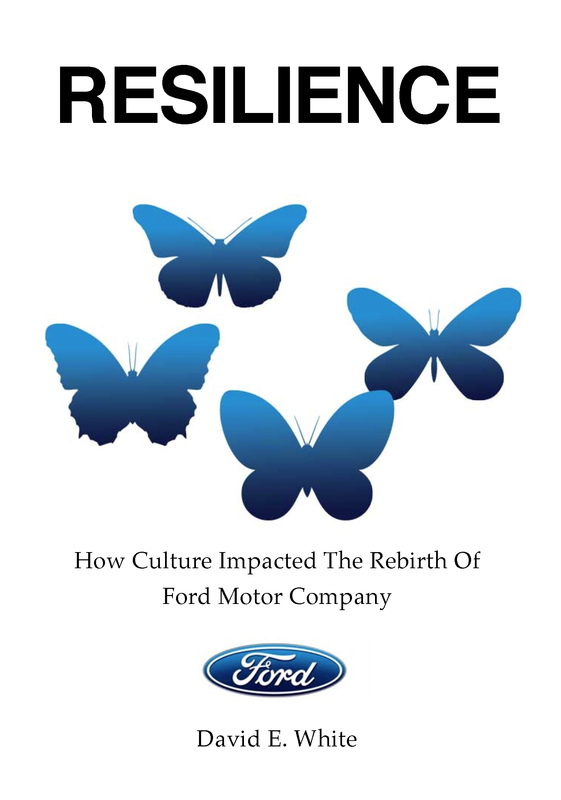 Resilience was not only modeled by leadership, but was permeated throughout the whole company – it was part of the Ford organizational culture. Ford reinvented the company through a culture of resilience. There is no sure way of knowing what life will bring and a static, linear process does not facilitate adaptive ability. Therefore, we stand the best chance at resilience (where we not only survive, but thrive, emerging better through the challenge) when we adopt language and actions based in defined principles. This allows us to become deliberate and consistent in our individual lives, our collective efforts in business and our inhabitation of this planet. The principles of purpose, promise, passion, partnership and posture, serve to facilitate resilience. It is the brilliance of One Ford. Resilience is available at iBookstore through iTunes.